These free macrame patterns will add some originality and boho vibes to your home and are budget-friendly enough, that you can make a dozen of them! They make great gifts as well; your friends and family will love that you took the time to make them something with your own two hands. Most of these projects only use macrame cord and a few other supplies. There are free macrame patterns for traditional macrame items like plant hangers and wall hangings, as well as some unique items like trivets, keychains, table runners, curtains, and even chairs and chandeliers. Use these basic macrame knots to make these projects today. Create a classic macrame plant hanger that you can hang indoors or out. It's a classic design that even uses its own cording to create the hoop that it will hang by. Here's another version of a macrame plant hanger to try. This one is designed specifically to hold a mason or canning jar. All you need is a jar, some macrame cord, and scissors to make this project. Macrame wall hangings are a popular way to showcase your knotting skills and this free pattern and tutorial gives you step-by-step directions on how to create this wall hanging by using just a few basic knots. Here's a free macrame pattern for a laptop mat, which could also be used for a placemat, small table runner, or even a trivet. It uses the square, horizontal half hitch, and diagonal half hitch knots to create an intricate design. With leather lace, some string, and fabric dye, you can make this stunning macrame necklace. Customize this quick afternoon project by changing the color of the dye or leaving it undyed for a more boho look. Here's a free macrame pattern that is quick to make and would make a great gift for anyone. The pattern makes two different keychains that use macrame cord along with wooden beads and embroidery floss. Macrame Key Chains from Hallmark Think. Make. Share. Make a statement with this giant macrame rope light. It will add a surprise element in any room in your house! You'll need cording, along with a lamp cord and socket kit to make this unique macrame piece. Add a touch of Scandinavian design to your dining room or kitchen with this free macrame trivet pattern from We Are Scout. A wooden embroidery hoop plus a few beads make this trivet a budget-friendly project that doesn't compromise on style. Take a t-shirt and with a few snips and knots, you'll have a macrame top. This one shows a white t-shirt that has been dyed, but you could use any t-shirt in your closet to create this stylish look. Create a wall display that your friends will envy with this free macrame pattern for giant feathers. You could easily modify the pattern to make smaller feathers that would be great for keychains or even ornaments. Grab a hoop earring and some macrame cord and you're all ready to create these stunning earrings. The directions are extremely easy to follow and you'll have yourself a new pair of earrings in less than an hour. To call this simply a dream catcher doesn't do it justice. This stunning wall hanging would look great in a nursery, bedroom, or anywhere in your home. With a plastic chair frame and a lot of patience, you can create a hanging macrame chair that looks like it came straight out of a high-end boutique. This tutorial shares a lot of trial and errors to help you successfully make it. Here's a boho-style macrame wall hanging pattern that uses just four knots to create a fairly simple design that looks impressive. It's such a versatile pattern, you'll want to make one for everyone you know. Add some warmth and texture to your dining room with this free macrame table runner from The DIY Mommy. Inspired by one at Anthropologie, this table runner will give you that sophisticated boho look ​that everyone will envy. Although smaller than the other macrame projects, this free macrame bracelet tutorial packs quite the punch. Use jewlery cord and connectors to create these stylish bracelets. 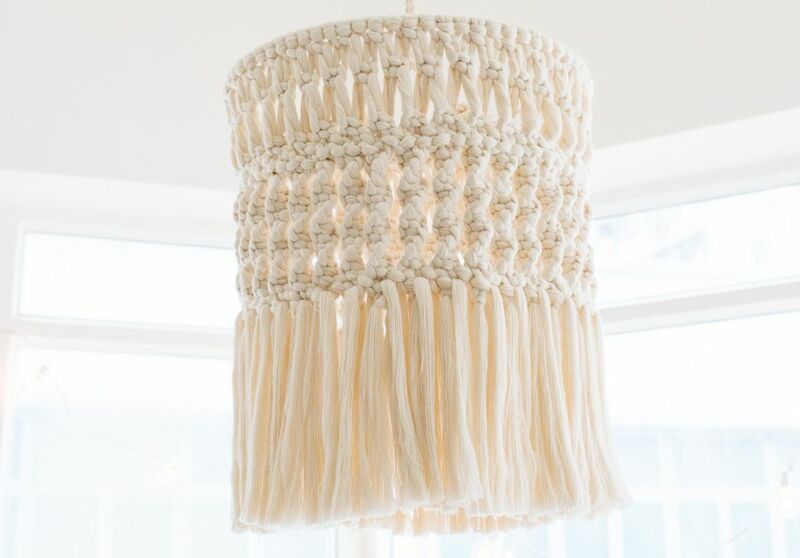 Here's another macrame statement piece—this time in form of a chandelier. Cording and a lampshade will create this jaw-dropping chandelier that will take you a good part of the day to complete. Here's another macrame chair pattern, but this one uses the frame from a lawn chair and different colors of cord to give it a retro feel with a modern twist. This free macrame pattern is for a bookmark that would look great sitting among your coffee table books. It's a quick piece to make and it would also be a great gift for any occasion.